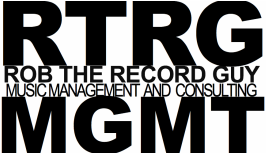 RECORDS - ROB THE RECORD GUY MGMT. CD'S! CYLINDERS! aND 8-TRACKS TOO! So how did I get to be known as Rob The Record Guy? I first became enamored of vinyl when my oldest brother returned from college with albums from The Kingston Trio and The Smothers Brothers. I did start buying new LP's and singles but really started gathering, more than collecting, when I bought, at a school library sale, Ricky Nelson's Million Sellers (because it was shiny!) and Toscanini's rendition of the 1812 Overture- on 78rpm. (Cannons!) From buying that Ricky record I figured there was a lot more great music than what I was hearing on WABC and even WNEW-FM. So I started frequenting Bleecker Bob's and the House Of Oldies. I didn't actually acquire the appellation until I started managing the 2nd Hand Tunes record chain in Chicago. While I used my full name for my radio appearances (on WGN-AM), many customers just called me Rob The Record Guy. And still do. So do I still buy and sell records? Oh, a just a bit. The picture above is from my home office. If you have a large collection in the Chicago area that you are looking how to find a new home for, I can spend a few minutes with you on the phone and make some suggestions. There are a lot of excellent reputable stores and private dealers around here and some excellent charities too. And maybe, just maybe, you have that one 45 I keep wanting a better copy of. Oh, and despite what many assert, High Fidelity's Rob Gordon is not based on me. Could've been, but wasn't. And here's a link to my online Fuzz radio station: INSTRO!